This is really an epic time for the Israelites. You could almost say it is when God finally cuts the cord and they begin to care for themselves. I say this because how did the Israelites get their food up to that point? What was God raining down on them? Manna. That's right. Now that they enter the Promised Land and begin to live off the land, the manna stops. God has given them a new good land with lots of food (flowing with milk and honey). But just in case anyone has forgotten. it was not an easy road to this Promised Land. It was not easy to get to this point. So that we can all understand the full significance and see how special this day is, I am going to fill in some of the blanks and give some background history on how the Israelites got to this point. Right before Israel enters the Promised Land they were simply a nomadic group of people that had wandered the desert for many years. Now God brings them to the edge of this new land. But before He lets them go in, He has one more test to see if they truly believe in Him and will follow His rules. At this point God tells Moses to choose one man from each of the 12 tribes. When these 12 men are chosen, they are then sent as spies into the Promised Land. They are sent to scour the land and bring back a report. Is it a good land? Who is there? Is it empty? Is there plenty of food and water in the land? The 12 spies head out and two of the 12 are Caleb and Joshua. Remember those names because they are important in the story. Ten of the 12 spies end up giving a bad report of the land. They say the land itself is good with lots of food, BUT they also say the people who live there are too big--they are giants. Their cities are too well protected, and the Israelites they don't have the strength to take the cities by force. The 10 spies specifically describe themselves as grasshoppers next to the Anakim. But Joshua and Caleb, on the other hand, tell the Israelites they CAN take the cities. Because God is with them they have nothing to fear, even though the inhabitants of the cities are huge. The people refuse to enter the Promised Land because they are scared. God becomes angry and sends them back into the desert until all the adults (the ones who refuse to go into the Promised Land) die. Those who refused to believe God would protect them in the Promised Land died in the desert. They weren't allowed in to the Promised Land. Why? Because they didn't have faith. Faith was required. It was not a suggestion or a good idea or something you just needed to be in the general ballpark area. No, you needed faith that gave you the courage to take a small group of nomadic people and go into in new land with big cities, each with high walls, big armies, and some of those cities inhabited by giants. And if the people are giants, so are their soldiers, and back then war was hand-to-hand combat (swords and clubs). So you had to have faith. And there was no going back. The children of those Israelites (the next generation), along with Joshua and Caleb (who had faith they could take the Promised Land), were later on allowed to enter the Promised Land. They knew God would take care of them in the face of giants. Here is where out story starts to get really intriguing because now comes the time for the Israelites to actually enter the Promised Land. Again, these are now the children of the first group of Israelites who refused to enter. The next generation. But in order to enter the Promised Land, they physically have to cross the Jordan River. Since they are in the wilderness there is no bridge. The Bible also says that it was during the rainy season so the river would have been full, moving fast, possibly even over-flowing its banks. Who here would welcome that task? Crossing a river on foot into a new land that is inhabited at least in part by giants. Remember no bridge, no life jackets, carrying your possessions on your back. Not easy, but again the people truly trusted God so they knew they could do it. They didn't always know how God would help them, but they knew he would be with them. Here is what God tells them to do. 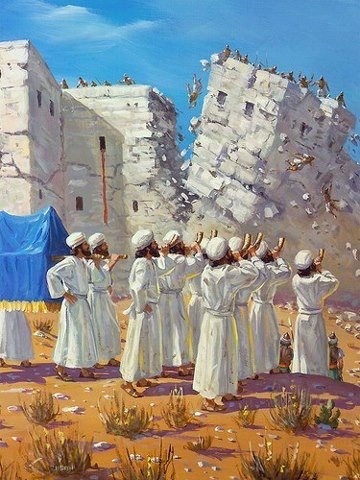 God says to Joshua, "Tell the priests to pick up the Ark of the Covenant and to go before the people. But the people need to keep 2,000 cubits (cubit = 18 inches, 3,000 feet) between them and the Ark. And they are not allowed to go near it." The people do all that they need to, and the priests take the Ark of the Covenant, and they walk ahead, right into the fast moving river. You know what happens? The river stops following. The Bible says the water backed up some distance upstream so the Israelites could cross on dry land. The people then cross the Jordan River, and as soon as the priests bring the Ark of the Covenant onto the other side of the river, what happens? The river flows again. The people of Israel are now safely across the river with the whole Promised Land before them. While that sounds great, remember there are many well fortified cities ahead, and some of them are inhabited by giants. The cities lie before them and the river at their back. Now God has one more task for them. and if they do it, it will show they truly trust in God--especially considering their new location. God tells Joshua to circumcise the men of Israel. Now you might be saying to yourselves, "Wait a minute...I thought the men of Israel were already circumcised. I thought that was one of the laws they were required to follow." The answer to that would be "Yes." That was a law, so they were supposed to be doing it. The problem was after the first round of circumcisions, right after the Israelites were freed from slavery, they did not circumcise any of their children, even after those children grew into adults. So the people of Israel, who had received the Ten Commandments and all those other laws, were starting to pick and choose which ones they followed. Remember these are the same Israelites who heard the Promised Land was very good, but also had giants living in it, and so refused to go in. Due to their lack of faith and probably their refusal to follow all of God's laws, they not allowed into the Promised Land. Joshua is now leading the people, they just entered the Promised Land, they have the Jordan River at their back, big cities in front of them (which they are going to attack), and God says, "Now I want you to circumcise all the men." I am not going to go into details. but they had no anesthetic back then, and their knives were made out of flint rock. After all the men are circumcised, the Bible says they waited in that place for a time while all the men healed. Sounds about right and no big deal, right? Actually, it is. Joshua just incapacitated his entire army, all the fighting men, for at least a few days, maybe even longer. They have a river at their back, big hostile cities (some with giants) before them, and now their whole army has to recuperate from surgery for a week. This is another act of huge faith. Think if one of our generals, just after marching all his men into Syria or Iraq today, forced all his men to have minor surgery on the same day. All of them. Everyone of the soldiers will be unable to mount a good fight for several days at a minimum. That would be crazy, right? Everyone of us would want that general fired. That would be a huge risk to leave your army so vulnerable. But that is just what happened to the Israelites. A short time later, God has one final task. God wants them to kept the Passover. In this new land they are to keep the holidays God gave them. And the people, without questioning him, do just that. Now is where we come to our Bible verse for today. Considering all we just covered let me read it to you again. When God says He has rolled away the disgrace from Egypt, He means they are no longer slaves to a foreign nation. They are a new people. Also, while slaves in Egypt, the Israelites were exposed to the pagan worship of the Egyptians. Some of them even brought those idols and those ideas with them when they were freed from slavery. Remember the worshipping-the-golden-calf incident where Moses throws down the Ten Commandments? The golden calf worship is something they learned as slaves in Egypt. The Bible says the Israelites celebrated the Passover, they kept God's laws, and then they ate the fruit of the land. The Promised Land was now theirs, and the land was providing for them. They were an independent, free people who were following the one true God. Because they were doing all God asked of them, they were being blessed. And on that day the manna stopped for good. This wasn't a bad thing. This was a great thing. All that God promised to his people was coming true. So how does this relate to us today? As God's people, we still need to follow Him. We still need to mind His laws and His plans for us. And what are the two greatest commandments, the two commandments on which all the other laws and rules depend? 1. Love God with all your heart, all your soul, and all your mind. 2. Love your neighbor as your self. You do those two things well, and you are fulfilling all the law. As God's people, we always need to be mindful of the fact that it is not our jobs to just sit back and let all the blessings rain down, as some preachers would have you believe. But instead we are to follow him. There are things we are required to do, as well. We need to show His love to others, to share our gifts, or kindness, and our blessings with those in need. Because it is in following Him and showing His love to others that we show the world that God is real. His blessings are real, His forgiveness is real, but, most of all, His love is real. And it is our job as His people to make sure all people have a chance to know Him, as well. Now the gates of Jericho were securely barred because of the Israelites. No one went out and no one came in. Then the Lord said to Joshua, “See, I have delivered Jericho into your hands, along with its king and its fighting men. March around the city once with all the armed men. Do this for six days. Have seven priests carry trumpets of rams’ horns in front of the ark. On the seventh day, march around the city seven times, with the priests blowing the trumpets. When you hear them sound a long blast on the trumpets, have the whole army give a loud shout; then the wall of the city will collapse and the army will go straight up, everyone will go straight in. Today I will tell you the story of the fall of Jericho. This is a story of how most of the Israelites did what God asked of them—not all, but most. As you shall see, when God's people do all He asks of them, they do well in the land He provided for them. When they break His laws and ignore His very clear instructions, bad things happen. Many of you probably remember how the Israelites marched around the city of Jericho several times and then blew their trumpets and the walls came down. That did happen, but there is also so much more to the story, and that is what we are going to discuss today. The Israelites are on the edge of the Jordan River about to enter the Promised Land. They are preparing to take possession of the land that God promised to their ancestors. Moses has recently passed away on Mount Nebo, and Joshua has taken his place as leader. Joshua then sends out two spies to the city of Jericho. Rumors are the city is big, with high, well fortified walls, so not only do they want to see the condition of the walls and if they are that big, but also what is the city like? Are the people confident, well armed, and scared of nothing. Or are they scared, without a strong leader, fearful, and likely to run away in fear? Remember, Joshua does not always know exactly how God will help them take each city, at least not well in advance. So he is being an astute military planner. He wants to know all he can about his enemy. When the spies get to Jericho they begin to check out the city, from inside and out. In doing so ,they meet a woman named Rahab. She takes them in and provides them a safe place. Once in Rahab's care, the spies learn from her that the whole city is terrified of the Israelites. The city has heard of how God freed them from Egypt. They heard about the 10 plagues God punished Egypt with. They heard about how God spread the waters of the Red Sea and how every army the Israelite's encountered up that day was decimated. The city of Jericho is scared because they know the Israelites are camped a short distance away from their city, and they appear to be next. Now, put yourself in their shoes. What if a foreign nation was about to attack the U.S., and whoever they fought against was utterly destroyed. What if no matter what body of water they encountered as they marched to their next target, their god simply moved that body of water out of the way. That's no small thing. How could anyone win against an adversary like that? What hope would you have against an enemy whose god moved lakes and rivers for them? None. Right? That would be pretty scary. But let's think of it another way. Instead of running in fear or fighting to the death, what if the people of Jericho asked questions of the Israelites about their God? "Tell us how your God does this? Your God obviously must be real and ours is not, or at a minimum your God is way more powerful. Can I learn about your God? Can you teach me?" What do you think would have happened? What would God have done if the people of Jericho let go of their false gods and began to follow Him? I am sure he would have relented. But that is not how the story goes. The king of Jericho finds out about the spies, and he sends soldiers to find them. At this point Rahab helps the spies climb out her window, and she lets them down outside the city wall with a rope. As the Israelite spies are leaving, they tell her to tie a red rope in the window so that, when they return with the full Israelite army, she and her family will not be destroyed. Which she immediately does. The spies return to Joshua and tell him the hearts of the people of Jericho have melted. They live in fear of the Israelites and their God. Just before the people of Israel set out for Jericho, God gives Joshua a message--but not just any message. And it is also whom God sends that is just as important.Now when Joshua was near Jericho, he looked up and saw a man standing in front of him with a drawn sword in his hand. Joshua went up to him and asked, “Are you for us or for our enemies?” “Neither,” he replied, “but as commander of the army of the Lord I have now come.” Then Joshua fell facedown to the ground in reverence, and asked him, “What message does my Lord have for his servant?” The commander of the Lord’s army replied, “Take off your sandals, for the place where you are standing is holy.” And Joshua did so. Now when Joshua was near Jericho, he looked up and saw a man standing in front of him with a drawn sword in his hand. Joshua went up to him and asked, “Are you for us or for our enemies?” “Neither,” he replied, “but as commander of the army of the Lord I have now come.” Then Joshua fell facedown to the ground in reverence, and asked him, “What message does my Lord have for his servant?” The commander of the Lord’s army replied, “Take off your sandals, for the place where you are standing is holy.” And Joshua did so.Now when Joshua was near Jericho, he looked up and saw a man standing in front of him with a drawn sword in his hand. Joshua went up to him and asked, “Are you for us or for our enemies?” “Neither,” he replied, “but as commander of the army of the Lord I have now come.” Then Joshua fell facedown to the ground in reverence, and asked him, “What message does my Lord have for his servant?” The commander of the Lord’s army replied, “Take off your sandals, for the place where you are standing is holy.” And Joshua did sJoshua 5:13-5Now when Joshua was near Jericho, he looked up and saw a man standing in front of him with a drawn sword in his hand. Joshua went up to him and asked, “Are you for us or for our enemies?” “Neither,” he replied, “but as commander of the army of the Lord I have now come.” Then Joshua fell facedown to the ground in reverence, and asked him, “What message does my Lord have for his servant?” The commander of the Lord’s army replied, “Take off your sandals, for the place where you are standing is holy.” And Joshua did so.Now when Joshua was near Jericho, he looked up and saw a man standing in front of him with a drawn sword in his hand. Joshua went up to him and asked, “Are you for us or for our enemies?” “Neither,” he replied, “but as commander of the army of the Lord I have now come.” Then Joshua fell facedown to the ground in reverence, and asked him, “What message does my Lord have for his servant?” The commander of the Lord’s army replied, “Take off your sandals, for the place where you are standing is holy.” And Joshua did so. Now when Joshua was near Jericho, he looked up and saw a man standing in front of him with a drawn sword in his hand. Joshua went up to him and asked, “Are you for us or for our enemies?” “Neither,” he replied, “but as commander of the army of the Lord I have now come.” Then Joshua fell facedown to the ground in reverence, and asked him, “What message does my Lord have for his servant?” The commander of the Lord’s army replied, “Take off your sandals, for the place where you are standing is holy.” And Joshua did so.Now when Joshua was near Jericho, he looked up and saw a man standing in front of him with a drawn sword in his hand. Joshua went up to him and asked, “Are you for us or for our enemies?” “Neither,” he replied, “but as commander of the army of the Lord I have now come.” Then Joshua fell facedown to the ground in reverence, and asked him, “What message does my Lord have for his servant?” The commander of the Lord’s army replied, “Take off your sandals, for the place where you are standing is holy.” And Joshua did so.Now when Joshua was near Jericho, he looked up and saw a man standing in front of him with a drawn sword in his hand. Joshua went up to him and asked, “Are you for us or for our enemies?” “Neither,” he replied, “but as commander of the army of the Lord I have now come.” Then Joshua fell facedown to the ground in reverence, and asked him, “What message does my Lord have for his servant?” The commander of the Lord’s army replied, “Take off your sandals, for the place where you are standing is holy.” And Joshua did so.Now when Joshua was near Jericho, he looked up and saw a man standing in front of him with a drawn sword in his hand. Joshua went up to him and asked, “Are you for us or for our enemies?” “Neither,” he replied, “but as commander of the army of the Lord I have now come.” Then Joshua fell facedown to the ground in reverence, and asked him, “What message does my Lord have for his servant?” The commander of the Lord’s army replied, “Take off your sandals, for the place where you are standing is holy.” And Joshua did so.Now when Joshua was near Jericho, he looked up and saw a man standing in front of him with a drawn sword in his hand. Joshua went up to him and asked, “Are you for us or for our enemies?” “Neither,” he replied, “but as commander of the army of the Lord I have now come.” Then Joshua fell facedown to the ground in reverence, and asked him, “What message does my Lord have for his servant?” The commander of the Lord’s army replied, “Take off your sandals, for the place where you are standing is holy.” And Joshua did so. What do we see happening now? God is behind His people. God has sent the commander of His armies (presumably the archangel Michael) to assist in the battle. But with God's presence (and His army commander's presence), what is still required? Reverence for God and what is holy. God's presence requires action on the part of His people. It is never just sit back and let the blessings role in. Remember, the commander of God's armies is standing there with his sword drawn. And he is neither for nor against Joshua. He is commanded by God alone. And Joshua is told to take of his shoes because the ground is now holy, which Joshua does. This, then, is the message God has for His people, which is also our Bible verse for today. So what is are the Israelites to do? Their fighting men march around the city once each day for six days, with seven priests each carrying trumpets, leading in front of the Ark of the Covenant. Not half way around today and then make it up tomorrow. Or if it rains, can we skip that day, and then add an extra day at the end? No, march around the city once a day for six days with all the fighting men, the priests, rams horns, and Ark. On the seventh day go around the city seven times. This time, have the priests blow their rams' horns. And at the final moment, have the priests blow one long blast from the horns, and all the fighting men should shout loudly. Then the walls of the city will collapse, and you can go in. But on the last day, after they had already marched around the city six times, Joshua gives the people more instructions. Just before they leave, he says, “When the walls come down, you must spare Rahab and her family. Whoever is in her house must be spared. And the devotional things in the city belong to God. The gold, silver, and bronze in the city of Jericho belong to God alone. Do not take them for yourselves. If you do take the gold, silver, and bronze articles, you will bring defeat on the nation of Israel and destruction on your household." So just a quick recap to see if you were paying attention, what two things do you need to remember when it comes time to enter the city of Jericho? What two things would you need to be sure to do? 1. Spare Rahab and her family and 2. Do not take any gold, silver, or bronze for yourself. Right? Any confusion? So the Israelites march around the city seven times on the seventh day. They blow their horns and give a loud shout and the walls of the city come falling down. The armies of Israel rush in and take over the city. There is no fight left in the armies of Jericho and the Israelites have no trouble at all. The two original spies who were helped by Rahab rush to her house, and she and all her family are escorted out of the city safely. And presumably no one takes any of the precious articles devoted to God (gold, silver, bronze, etc.). And all seems well, a job well done. Very soon thereafter Joshua sends a new group of spies to check out the next area of land they will take over. The area is called Ai. When the spies get back from checking out Ai, they tell Joshua there is only a small number of people in the area, and they will have no trouble taking it over. In fact, the number of people in the land is so few, don't bother sending the Israelite army. Just send in a few thousand. It will be a piece of cake even for a few thousand. So Joshua does just that. He sends in 3,000 soldiers to take over the area call Ai. The problem is when the Israeli soldiers get there, those small numbers of people fight back and end up driving the 3,000 Israeli soldiers away, killing a few dozen in the process. When the soldiers return to Joshua defeated, Joshua becomes angry, tears his clothes in disgust, and throws himself on the ground in front of the Ark asking God why this happened. "Why, God? Why? Why would You let this happen to Your people? Now the world will see You are against us, and Your good name will be damaged here on earth." You know what God says in return? "Get up off the ground. Your army was defeated because the people did not obey Me. Some of them took gold and silver for themselves when they entered Jericho. If the people obey Me, I will be with them. If they will not follow My instructions, they are on their own. Tomorrow you will call the Israelites before Me, and I will identify the one who stole what he was not supposed to." The next day Joshua has all the Israelites line up, and he starts narrowing down the possible culprits. He goes from tribe, to group, to clan, to individual family. Then Joshua stands before one man named Achan. Joshua says, "What did you do? What did you do to bring this defeat on us?" Achan says, "When I went into Jericho, I saw all the gold, silver, and bronze, and I wanted some for myself. I took some, and it is buried under my tent." Joshua sends some men to Achan's tent, and they find the gold, silver, and bronze that he stole. They then take Achan, his family, his animals, and all he owns outside the camp, and there they are stoned to death. Very soon thereafter, Joshua and his army go up against Ai again, and this time they win. And in this city, God tells them the plunder of the city is theirs to take. All gold, silver, anything precious they can keep for themselves, which they do. Now this may seem like a complicated story, but in reality it is not. God told the Israelites many times, "If you follow Me and My laws, things will go well for you. But if you do not follow my laws, I will not protect you." What two rules did God give the Israelites right before they entered the city of Jericho? 1. Protect Rahab and her family and 2. Do not take gold and silver for yourselves. It belongs to God. What rule did someone break immediately upon entering the city? Achan stole some gold and silver and hid it in the ground. Here is what is sad about this. Achan knew it was wrong; otherwise why would he have buried it? He was trying to hide it. He wanted to get away with taking the gold and silver he was not supposed to. He knew he was breaking a rule, but he did it anyway. You may ask yourselves: why did God want the gold and silver from the first city, Jericho, but not the second city of Ai? Think of it like an offering. God told the Israelites they were to give their first 10% to Him. The first harvest of good fruits and grains, the first born calf. If the people did this, they were showing they trusted in God. They knew God would care for them even if they gave away their first 10%. So the city of Jericho was like the first 10%. It was mean to be set aside. And just like today, it is a particularly disgusting crime if someone were to break into here and steal the offerings that were meant to go to the local homeless missions, or Haiti, or Africa. Stealing is never good, but it does seem worse when someone knowingly steals from money given to the church. There is something different about it. And that is one of the points of this story. God had a very clear purpose for His people, the Israelites. He was raising them up as a nation. He gave them laws to set them apart from other nations. The purpose was to make them a better people, which would then draw in other nations to God. It is too small a thing to only keep you as my servants. I will make you a light for the Gentiles, that my salvation will reach the ends of the earth! Good people here today, the message of God reaching the ends of the earth will not happen if God's people do not follow Him completely, or if they are stealing from Him and hiding it under their tent. God was singling out the Israelite people for one purpose: to be the nation to remain true to Him so that one day the Messiah might come through them. The Messiah that would bring salvation to the ends of the earth. These are God's own words. So whenever you remember this story or think of other stories in the Bible, remember this one thing. God's purpose with all these laws, rules, and long history with the Israelites was to bring salvation to the ends of the earth. And that is no small task. Jesus himself gave that command to his church, and that task remains with us today. To go and make disciples of all nations, baptizing them in the name of the Father, the Son, and the Holy Spirit. The Israelites had their purpose and today we have ours: to make the salvation of Jesus Christ known to all. May God continue to richly bless you, and may we continue to let His light shine brightly. When they were approaching Jerusalem, at Bethphage and Bethany, near the Mount of Olives, Jesus sent two of his disciples and said to them, "Go into the village ahead of you, and immediately as you enter it, you will find tied there a colt that has never been ridden; untie it and bring it. If anyone says to you, `Why are you doing this?' just say this, `The Lord needs it and will send it back here immediately.'" They went away and found a colt tied near a door, outside in the street. As they were untying it, some of the bystanders said to them, "What are you doing, untying the colt?" They told them what Jesus had said; and they allowed them to take it. Then they brought the colt to Jesus and threw their cloaks on it; and he sat on it. Many people spread their cloaks on the road, and others spread leafy branches that they had cut in the fields. Then those who went ahead and those who followed were shouting,"Hosanna! Blessed is the one who comes in the name of the Lord! Blessed is the coming kingdom of our ancestor David! Hosanna in the highest heaven!" Then he entered Jerusalem and went into the temple; and when he had looked around at everything, as it was already late, he went out to Bethany with the twelve. Today is Palm Sunday. This day we celebrate Jesus's entry in Jerusalem. This event is also commonly called the Triumphal Entry because it is when Jesus finally and openly announces to all that he is the Messiah. Up to this point Jesus had in small ways told people who he was, but it was always minimal. Just like the miracles he did, it was not about bringing himself fame and glory. In fact, with most of the miracles Jesus did, he made a point to make sure it was not publicized. He never wanted it to be about the miracle but instead the man behind the miracle and what his purpose was. The same is true when Jesus began to announce to the world who he really was. He always wanted to maintain the focus on why he was there. Not just simply "The Messiah is here. He will give me everything I need. He will solve all the problems in my life." He specifically wanted to avoid being seen as someone's personal genie in a lamp. Jesus, in fact, was the exact opposite of a genie in a lamp. His purpose was God's purpose, not ours. His arrival on the scene was the culmination of thousands of years of God working to save mankind. Jesus was the focus of all the prophecies and all the Biblical writings, and they pointed forward toward him. So the day that we celebrate as Palm Sunday could probably be more accurately named Prophecy Completion day. The reason I say this is because there is so much going on and so much coming together. This day really is one of the best examples of a couple thousand years of prophecy, writings, and hopeful anticipation bursting through the metaphorical door. Like at a big sports arena, as the home team comes running down the onto the field before the big game, they break through a paper barrier and the crowd goes crazy. This is very similar. Everything is coming together as people are lined up, shouting, waving palm branches. That's their version of the big foam hand with the index finger pointing up (we're #1). So it's a great time. But like just about whatever Jesus does, everything has a purpose. Everything means something. Nothing just happens by chance. Examples are riding on a donkey, the palm branches, people shouting hosanna, even at the end of our verse when Jesus arrives at the temple and then turns around and goes back to Bethany. It seems very anti-climatic right? Yet, everything thing that happens has background and meaning and that is what we are going to talk about today. It's my hope that, at the end of this sermon, a lot of pieces from way back in the Old Testament and some of the new writings from the New Testament will really start to make sense and fit together. In the first part of our story, Jesus tells the disciples to go get this donkey and bring it to him. It may seem strange to ride on a donkey when you are announcing to the world that you are the Messiah. It would seem more appropriate to ride around town on a huge beautiful horse, or in a gold-trimmed chariot, or even a chariot of fire like Moses rode in. Well, a couple thousand years ago, whenever you conquered a new city or town, the victors typically rode through town on huge war horses or even in their chariots. They were, in a sense, showing off their power--the reason they were able to conquer the town the first place. It was a sign of military victory. But there was also an ancient Middle Eastern tradition for kings to parade through their towns on a donkey as a sign of peace. This would have been known by the people of Jesus's day, and they would have seen Jesus entering the city not as a military commander conquering the city but as a peaceful king. There is also a precedent to this use of a donkey in much earlier Jewish history. About a thousand years before, many of the judges of Israel rode on donkeys through the towns as a sign of peace. It showed their leadership, that they were in control, but also that they came in peace. When King David chose Solomon to be the next king, he had him paraded through town on a donkey. The reason? To show people this was a peaceful, prosperous transition. You could imagine the difference if the people knew Kind David was getting old, had several sons, and now one of them was parading through town on a huge war horse. You could see where they might understand that as a military take-over. One of his sons used force to get to the throne. But when Solomon rode through town on a donkey it meant there was a peaceful transition. It was a very good thing. Many years later, but before Jesus was born, the prophet Zechariah made this prophetic statement about how the future Messiah would arrive. Notice the picture these words paint of how Jesus would enter the city. "Your king comes, righteous, with salvation, gentle, riding on a donkey." That sounds perfectly in line with how royalty had used donkeys as a sign of peace for a very long time. Next, as Jesus actually rode the donkey into the city, there are three things the people did to recognize him as the Messiah, the new king. First, they laid their cloaks on the road for the donkey to walk over. They did this a sign of submission. Laying your own clothes on the ground for someone else to walk on so their feet don't get dirty (or the feet of their donkey doesn't get dirty) is a pretty big sign of submission, of wanting to raise someone up. The second thing they did was to take palm branches and wave them in the air. When you think about it, that may seem strange as well. Here comes the new king; let's run over there, get some branches, and start waving them. Today, that seems odd. Why not just clap and shout, "Long live the king," and comment how majestic he looks riding on that donkey. But the palm branchesmeant something. The people weren't just doing random things. Here is what the palm branches meant. Remember, a long time before Jesus there was a really important prophet by the name of Moses. And he freed the Israelites from the Egyptians, and they then wandered the desert for 40 years. To help the Israelites remember that event, God gave them a holiday called the Feast of Tabernacles. This is a big celebration the Jews celebrated, even today they do, where they build small, essentially lean-to shelters to remind them of their ancestors' time in the desert. The Israelites, during their 40 years in the desert, lived in temporary, movable dwellings. So this festival was meant to remind them of this event. One of the things they do during the feast of Tabernacles is to hold together branches from the Date Palm, Willow, Myrtle, and Etrog (similar to a lemon). They would hold up these branches and wave them in all four directions, as well as up and down, to symbolize that God was everywhere and was always present, caring for their needs. Even as they wandered in the desert for 40 years, God provided for them. He was their king, their leader, and their source of salvation. (See where this is going?). So every year since the wandering in the desert, the Israelites would wave palm branches, along with branches of the willow, myrtle and Etrog as a sign of celebration and to remember who provides salvationThey would hold up these branches and wave them in all four directions, as well as up and down, to symbolize that God was everywhere and was always present, caring for their needs. Even as they wandered in the desert for 40 years, God provided for them. He was their king, their leader, and their source of salvation. (See where this is going?). So every year since the wandering in the desert, the Israelites would wave palm branches, along with branches of the willow, myrtle and Etrog as a sign of celebration and to remember who provides salvation. The last thing the people of Jerusalem did as Jesus entered the city was to shout "Hosanna". Hosanna is often thought of as a declaration of praise, similar to hallelujah. We think it means "Hurray! Three cheers for the king!" But it is actually a plea for salvation. The Hebrew root words for Hosanna, yasha (“deliver, save”) and anna (“beg, beseech”), combine to form the word that, in English, is “hosanna.” Literally, hosanna means “I beg you to save!” or “please deliver us!” So the people of Jerusalem, as Jesus entered, were holding up palm branches (which were meant to remind them of God saving and providing for them in the desert for 40 years), and they were shouting "Hosanna" which meant "We beg you to save us, to deliver us." They were chanting and shouting for Jesus to save and deliver them. Which right off the bat sounds great. Right? Here we have Jesus entering Jerusalem declaring himself to be a peaceful king, and now the people chanting, "Save us, deliver us, we beg you". Sounds like it is all going extremely well. But we know it didn't go well because a few days later those same people were chanting for Jesus to be crucified. They asked for a convicted criminal Barabas to be released and Jesus to take his place. Why? How could they do such a fast, 180-degree turn? Unfortunately, the people of Jerusalem wanted a Messiah but only the Messiah that was right for them. They wanted the genie-in-a-lamp type of Messiah. Basically, here is my wish list. Do this and you can be our true Messiah. So they welcomed Jesus out of their desire for a deliverer, someone who would lead them in a revolt against Rome. They wanted a revolution. They wanted their Messiah to be a great warrior to make them a great and powerful nation. There were times in the Israelite history when they were a great military power. But when, and only when did that happen? When they were first following God's laws. When they were following God. But what happened the minute they stopped following God? A foreign nation conquered them. You know how the Israelites overthrew the conquering nation in the old times? They followed God again. THEN God delivered them. But what is their major problem now? They were conquered by the Romans because they no longer knew God nor properly followed his laws. And instead of getting right with God first, what do they do? They want a military revolution, a military leader to get rid of the Romans without having to get right with God. They actually take God out of the picture. It's now just about them and what they want. They became blind to the cause of their situation and were unable to see the cure. These are the people who sing and dance as Jesus enters Jerusalem. They sing Hosanna, shake palm branches above their heads, and the whole Jewish community celebrates. But what do they do once they realize there isn't going to be a revolution? They all go home. That's the reason Jesus, once he enters the temple sees that it's late, and everyone has gone home; that's the reason he turns around and goes back to Bethany. After a few days, these same people become angry. The high priests get them riled up, telling them Jesus is an imposter. He can't possibly be the Messiah because we are still a conquered people. We are not strong militarily. So Jesus is a heretic. And what did religious leaders do with heretics? They had them executed. Before I finish I want to share with you one last but very important verse from the Bible. It's in the Old Testament in Genesis chapter 49. I am sure all of you have heard the name Abraham. Abraham had a son Isaac, and Isaac had a son named Jacob. Jacob had 12 sons and these 12 sons became the nation of Israel. Right before Jacob died, he gave a blessing to each son and told them a prophecy about what would come from each of their family lines, from their tribe. This is part of the prophecy he gave to one of his sons named Judah. This may not sound like much right off the bat, but let me explain what each part meant. "The scepter shall not depart from Judah." This meant the line of kings would come through Judah, as well as the Messiah, who was the King of kings. Guess who came from the tribe of Judah? King David, King Solomon, and eventually Jesus. Next the prophecy says, "nor the lawgiver from between his feet, until Shiloh comes". This gets even more interesting because the lawgivers in those days were the kings. So when it says, "The lawgiver (the kingly line) won't pass from the tribe of Judah, until Shiloh comes.” Guess what Shiloh means? Shiloh is another word for Messiah. So the kingly line will stay with the tribe of Judah until the Messiah comes. Guess when the kingly line of Judah died out? Shortly before Jesus was born. Remember who was king when Jesus was born? King Herod. Herod was of Arabian descent. He was not Jewish. So by the time Jesus comes into the world, what tribe for the past 1,000 years no longer holds the throne? The tribe of Judah. Believe it or not there are rabbinical writings from this time period in which Jewish scholars discussed this same information and were greatly troubled by it. Here the prophecy from Jacob, which was about 1,500 years old, did not seem to come true. Or so they thought. The line of kings from Judah died out and no Messiah. This caused great distress for several of the Jewish scholars. But here was their problem. And it was the same problem the people of Jerusalem had. The Messiah they wanted, the only Messiah they would recognize, would be a military ruler to overthrow the Romans. That was the only Messiah they would accept. Anyone else was a phony in their eyes. It didn't matter if Jesus raised people from the dead, if he could feed 5,000 people with a few loaves of bread and a couple of fish. It didn't matter if the blind could see and lame could walk because of him. If he didn't raise up an army and destroy the Romans, he wasn't the Messiah they were looking for. So even with all the prophecies, these writings that point directly at Jesus, they looked at Jesus and said, "It can't be him. The Romans are still here." But that's not why Jesus came into this world. Even the prophecy from the book of Zechariah we just read said the Messiah will come, and he will be "righteous and having salvation, gentle, riding on a donkey." The most important thing for us to remember is that Jesus is God's Messiah, he was sent by the Father, to save us. He was not sent to do our bidding or start a war with people we don't like. He is the culmination of thousands of years of prophecy. So many things the Jews did as Jesus rode into Jerusalem signify him as the Messiah. But they refused to accept him because he didn't start a war with Romans. Palm Sunday is really a day about recognizing who Jesus is. He is the Messiah. He came to love us, forgive us, and die for us. He is the beginning and the end of all creation. So whether you celebrate this day with Palm branches or in any of the other many ways to celebrate great days, celebrate this day. It is the day the world cried out for and longed for so long. It it the day the light of the world became known to all. Today, celebrate this day with your families. Celebrate it the way most people celebrate Super Bowl Sunday. Have friends over, eat, be joyous. But, most of all, be joyous because you have been saved. You are worth everything to God. In your best days rejoice and be happy. And in your worst days, hold on dearly to the cross and know that he was sent for you, and he is always with you. I was listening to a radio station earlier this week, and they were talking about Easter being this week. The question of the day was, "Are you going to heaven?" This turned out to be a bigger question than the radio host anticipated because it got lots of call-ins and people stating what their beliefs were. One thing that really made this particular discussion important is because he asked not only, "Are you going to heaven" but "Why are you going to heaven?" These were good questions, and it started a good discussion because there is a general consensus that Easter has something to do with getting to heaven or getting closer to God. But how it all fits together and how one thing leads to another--until BAM, entrance into heaven. That's where you get differences in opinion. It was surprising how varied the responses were. And trust me, the responses were all over the board, along with the reasons behind why someone is or isn't going to heaven. One man who identified himself as a Jew said he was going to heavenbecause he is a Jew. Simply being Jewish in family ancestry and following the Jewish faith to some degree gets you into heaven. When he was asked what about being Jewish "fulfilled the requirement" for heaven, he was silent for a moment and said because "we are God's people." The lesson from this gentleman was if you want to go to heaven, be Jewish, and follow their religious doctrine to at least some degree. When he was asked about the sacrifices the Jews used to give before the temple was destroyed and why they don't do them now, that question became harder to answer. He really couldn't give a concise answer as to how that affects their ability to get into heaven. To give a little background, the Jews used to offer sacrifices to atone for their sins. But since the temple was destroyed two thousand years ago (shortly after Jesus was crucified), how does not doing the sacrifice affect their entrance into heaven? Since they are not atoning for their sins anymore, how can they get into heaven? This was a question he could not answer. Another caller stated that he was Catholic, and the only way to get to heaven was to be a good Catholic. When asked what made someone a good Catholic, he replied, "adhering to the Catholic sacraments, going to confession, when you die you need to die in a state of grace, and then to work off your sins in purgatory, and then you get to heaven." So the lesson from this caller was to be a good Catholic, follow the Catholic teachings, and successfully get through purgatory. Another caller was someone who stated she didn't really believe in God or a higher power. But she thought she was a good person, and if there was a God, they should be allowed into heaven because they are good. When asked what makes their idea of being good the right type of good and therefore good enough to get into heaven if it exists, she was temporarily stumped. The caller then said that as a society we all know what is good, and therefore we all are born with a sense of what level of goodness it would probably take. When she was asked to explain how something like slavery, having seen as a good institution by some, even perfectly legal in the United States for a long time, is now seen as horrible. She replied that what is seen as good can change over time, and it matters within a society. So what is acceptable at one point in time may not be so later, but for that group it still counts as good and therefore is good enough to get into heaven if it exists. This went on for a while with lots of different people giving their version of why or why not someone is good enough to get into heaven. But towards the end, there was one older gentleman who said he was going to heaven because he believed in Jesus Christ. Since Jesus paid the price for his sins, he believed he was going to heaven. Obviously, his answer was the correct one. I am not saying that simply because I believe the same thing, but because the other answers people gave showed how far off so many of us have wandered from the truth. How we have forgotten large parts of our history, forgotten why we do what we do, why Jesus did what he did. And how we replaced those lessons with ideas that make us more comfortable or keep out others whom we are not comfortable with. To truly understand how great Easter is and what it means in relation to heaven, I want to talk about some of the ideas that each of the callers touched on in one way or another because they contain part of the truth but not the whole truth. Easter is actually a day we celebrate salvation. It is that salvation, which frees us from sin and separation from God, that allows us to be with Him in heaven forever. Talking about how to get into heaven is not really the right question. Sometimes my heart aches a little when I hear someone ask, "How do you get into heaven?" That question by itself is not a good question. It almost seems like the goal is just to get the pass code to get into the gated community that is heaven. It's almost as if it doesn't matter what goes on there, who is there, or really how you get in as long as you get the code. But that really leaves out so much. As I said a minute ago, Easter is really about salvation and bringing us back to God. Salvation is, in and of itself, an incredibly large word. It encompasses something so big and wonderful that the word "salvation" does not do it justice. To those who come from a situation where there is no belief in salvation to truly feeling saved, the feeling is almost too difficult to describe. Almost as the way the word "love" sometimes does not seem like a big enough word. For an emotion which is at once so beautiful, incredible, there's just no way our English language could do justice to what that feels like. And salvation is just as great, if not much greater. To truly understand how immense Jesus' dying on the cross and then rising again was, we need to go beyond just the words "died and rose again." And to do that we need to ask some questions: why did Jesus have to die and rise again? How is Jesus dying on the cross related to the sacrifices the Israelites used to give? How did giving a sacrifice make up for your sin. somehow? How did Jesus rising from the dead on Easter replace having to sacrifice animals to atone for our sins as the Jews used to do? These are the big questions, and, as we answer them one by one, you will see how it all fits together. With the first sin of Adam and Eve (eating the apple), we humans were separated from God. Jesus dying on the cross and rising again healed that damage, the separation done by sin, and thereby allowed us to come again into God's presence, in heaven. Separation from God is paramount to understanding our Christian faith, and it has everything to do with why Jesus died and rose on Easter. This separation from God is evident soon after creation. And it involves what happened to Adam and Eve afterthey ate the apple. What did they do right after they ate the apple? Do you remember? It says they hid from God. Two grown adults ran and hid from God. Now think about as if that were you. How scared would you and your husband/wife (do me a favor and look at your spouse right now), how scared would both of you have to be in order to decide that running and hiding from God is the best option? Don't simply consider it quickly and then move on. Put yourself in their shoes. What would it be like to try to run and hide from God? What level of separation and fear would you have to feel in order for the best option to be to run and hide from God? The separation you feel woulbe be complete, irreparable. That is a situation without hope, without protection; there is no safe haven, no safe place to retreat. This is what life without salvation feels like. They couldn't hide or remove the stain, the infection they allowed into their world. Their action (of trying to hide from God) is an action of someone with no hope, who feels completely cut off. Let's look at another example in the story of Cain and Abel, the sons of Adam and Eve. The story goes that Abel brought an offering of the best of his flocks to the Lord, and Cain brought some of the grain and produce from his fields but it was not his best. The Bible says God accepted Abel's offering but not Cain's. Cain becomes very angry, and it says his "face was downcast." Cain, because of his selfishness, because of his own actions, felt the separation from God. He knew it in his bones that he was wrong. But he did not try to make up for it, to turn back to God. What Cain refused to see is that the sacrifice, the offering, that God required was a form of protection from future sin. It was a huge outward action to show that you were focused on God. If Cain gave grain that was a rotten and worthy of the garbage pile, what was he showing God? What place did God have in his heart? No place at all. In Genesis Chapter 4, God says this to Cain, "If you do not do what is right, sin is crouching at your door, it desires to have you." That should sound scary and creepy, because it is. God instituted the offerings and sacrifices the Israelites performed for so long because He wanted their focus to be on Him. If they gave Him the best of their flocks, the best of their fields, their hearts would always remain focused on him. If they strayed and did not do the sacrifices, or if they gave an offering of things they didn't want, there would be an opening for Satan to creep in. It would be a sign they were focused elsewhere. Their hearts were somewhere else. For a long time the Israelites offered up these sacrifices. These sacrifices atoned for their sin because God knew when they gave freely of their best possessions, they were truly sorry, and truly wanted to no longer sin. The problem was, their sacrifices had to be offered all the time, daily, weekly, monthly because they were always sinning. Nothing they did atoned for their sinsonce and for all. Interestingly, as the time came for Jesus to enter our world, the Israelites developed a custom of tying a red cord around the sacrificial animal and a red cord around the temple gate. If they performed the sacrifice correctly and were truly sorry for their sin, the red cord would turn white. They would take this as a sign from God that their sins were atoned for and their sacrifice was accepted. Sounds good, right? You would know right away if you did it right. This practice worked well until around the year 30 A.D. After the year 30 A.D., the Jewish religious leaders noticed the cord no longer turned white. The Talmud (which is part of the Jewish Bible) states that during this time the fires near the altar would frequently go out, and the temple doors (which were always shut at night) would be found open in the morning. The Talmud states these events happened for 40 years before the temple was destroyed. We know pretty reliably the temple was destroyed in the year 70 A.D., and the estimates of the date for Jesus' crucifixion are between A.D. 29-33--right during the time these changes occurred. What we can take from this is the death of Jesus (which paid the price for all our sins, once and for all) meant the daily sacrifice was no longer needed. That is why the red cord never turned white again. Let me read to you what John the Baptist said when he saw Jesus walking toward him. He said in John 1:29, "Look, the Lamb of God who takes away the sin of the world!" Jesus took all our sins away, eliminated the need for the temple sacrifice, and destroyed the separation between us and God. Just as when Jesus died on the cross and the temple curtain was torn in two, we are no longer separated from God. We have been wiped clean. As I said in a previous sermon, the temple curtain separated the holiest part of the temple (where the ark of the covenant was kept) from the rest of the temple, and only the high priest was allowed to go in that area once a year. When Jesus died on the cross, the Bible tells us the temple curtain was torn in two, from top to bottom. The significance of this is there was no separation from God anymore. No more would there be a barrier between God and us. Jesus has wiped us clean. Here is where this message really gets awesome. A common criminal was dying on the cross next to Jesus. As far we know, he never atoned for his own sin by offering a sacrifice. We don't even know if he was Jewish or not, if he ever followed any religious dogma, ever went to confession. This man looked to Jesus before he died and said, "Remember me in your kingdom." And in doing so, this one act, this reaching out when all else is lost, he was deemed worthy of salvation. The separation he felt all his life, the guilt he felt for all the crimes he committed (because remember, he said while dying on the cross, he—not Jesus--deserved this type of death) was healed. In an instant he was wiped clean because of what Jesus did. For all of you here, there is no amount of good in this world you can do to earn your way into heaven. There is no merit badge good enough in any denomination (Catholic, Lutheran, Baptist) that will get you the gate code to get into heaven. If you're Lutheran, be a proud Lutheran, if you're Catholic, be a proud Catholic, or whatever denomination you call home. The main thing we need to know--the only thing we need to know--is that Jesus paid our debt. Our separation from God is no more. Here is a final thought on this great day. Easter is not about getting a gate code to get into heaven. It is the beginning of a new life, a life not spent in darkness, carrying guilt, a life of loneliness, without direction. It is a new life in the light. And there is probably no better prayer I have ever heard in all the Bible than the prayer of the criminal dying on the cross next to Jesus. His words sum up all of humanity and our hope to once again be in the presence of God. "Jesus, remember me, remember me when you come into your kingdom,"
And Jesus shows that he, alone, is the way. He replied to the criminal, "Today you will be with me in paradise"
Have a wonderful day! And may God be with you always.